Do you wish you could have long, thick hair? 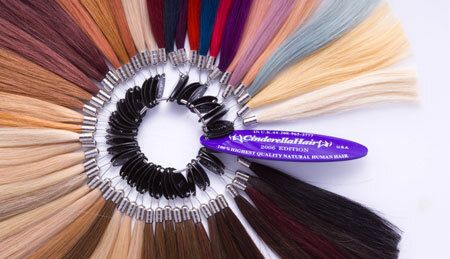 With the application of hair extensions, you can have long, healthy, thick hair in hours, not years! Women love the and allure of long flowing hair and yet many do not have the length, volume or even the patience to grow their hair out. Others want to flirt with the idea of trendy bold hair colors, but do not want to bleach and layer color, or worry about color fading between appointments. We offer hair extension application and maintenance services Saratoga Springs salon using 100% Human Hair by Cinderella Hair. With the help of Extensions and Our Hair Your Way® by Cinderella Hair, this dream can become reality! Whether you are looking for fuller hair that you can play with new styles, or if you need extensions to create the bridal hair of your dreams, if you want to openly support a cause of the month, or just wanted to add colorful pops of purple and turquoise to your style, hair extensions are a perfect solution for you! After all, why shouldn’t you have length, volume, color and highlights you wish you could have for that special day, or just make yourself feel more special every day? If you think you are ready to take the next step towards having that long hair of your dreams, call us today to make an appointment! 518-791-6634.